The Arkansas Archeological Survey has collaborated with archeologists at the Ozark-St. Francis National Forests and the Ouachita National Forest on a number of successful research projects. These efforts continue in June, 2017 with the Mulberry River project. Two students from Deer School excavating in the Rockfall Shelter, Spradley Hollow. 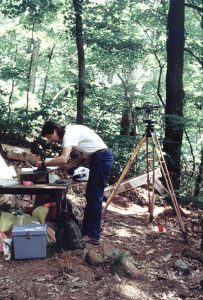 After the Survey successfully teamed up with Ouachita National Forest archeologists in 1993 for the Training Program at Shady Lake Recreation Area in southwest Arkansas, we received a request from the Ozark-St. Francis National Forests. 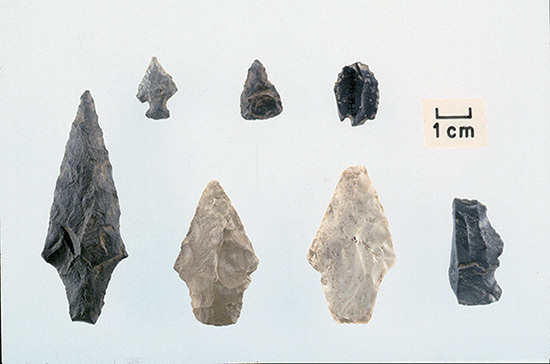 In June 1994, excavations were conducted at four bluff shelters (3NW623­–3NW626) and a historic homestead site (3NW919) near Nail, within the Buffalo Ranger District in Newton County. With over 200 people in attendance, the 31st Annual “Society Dig” was the largest ever. Staff from the Arkansas Archeological Survey and the Ozark National Forest contributed 1,390 hours supervising excavations and teaching seminars. Fifteen Newton County residents from Deer, Nail, Jasper, and Vendor also participated. Some looting had occurred at the bluff shelters in the past, and Forest Service archeologists wanted to better understand the extent of the looting and whether or not intact archeological deposits remained. They also were interested in developing strategies for understanding the structure of early twentieth-century homesteads where subsistence-level farming took place. Artifacts dating from the Archaic through Mississippian periods were found at all four bluff shelters. A variety of activities were carried out at the shelters, including food preparation, stone tool manufacture and maintenance, nut processing, and use of hematite as pigment. Analysis of flotation samples from the Open Shelter included seeds from wild goosefoot and maygrass. Domesticated versions of these plants are part of the Eastern North American Crop Complex. Two of the shelters revealed evidence of use during the early twentieth century as a still location and an animal pen/watering area, respectively. Remains of the house foundation and mostly kitchen-related artifacts were excavated from Beckham Homestead. The number and types of artifacts found (and archival research) indicate that the Beckham family were subsistence farmers who eventually lost their land due to non-payment of taxes. 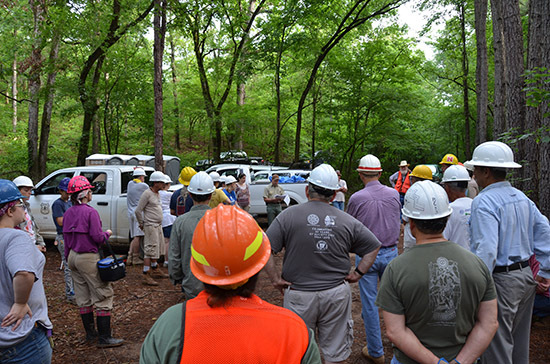 Professional and volunteer archeologists gather for a Ouachita National Forest briefing at the start of the 2014 Society Training Program. Projectile points from the Open Shelter, Spradley Hollow. Jerry Hilliard supervising excavations at the Petroglyph Shelter, Spradley Hollow. The Survey was awarded a cooperative agreement (AAS Project 14-05) with the U.S. Forest Service to conduct a survey in the Boston Mountain Ranger District. Mary Brennan, Forest Service Archeologist, conceptualized this project in order to survey targeted bluff areas where the potential for rock shelters and caves is great but where virtually no previous recorded sites have been documented. The demand for Forest Service archeologists to survey project areas such as timber sales, prescribed burns and others related to Section 106 Review is such that many bluffs and special use areas in the Ozark-St. Francis National Forest have not been inventoried for cultural resources. This cooperative agreement between the Survey and the Forest Service was initiated so that portions of the FORD Project, selected by Mary Brennan, could be surveyed for bluff shelters and historic sites. The Devil’s Canyon area was chosen based on its steep terrain, known waterfalls, and other special use natural features. It is also located within about ten kilometers of three known rock art sites. Over the course of fifteen field days during the winter and early spring of 2013–2014, seventy-five archeological sites were recorded. Most of these are bluff shelters, some appearing in pristine condition with little to no evidence of looting. The Survey team included Jerry Hilliard, Jared Pebworth, Mike Evans, Aden Jenkins and Devin Pettigrew. 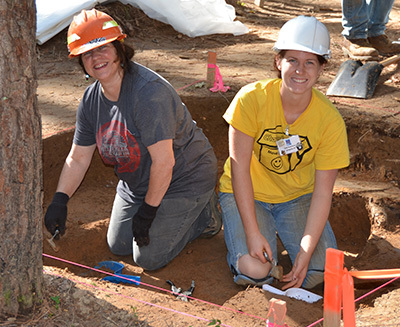 Forest Service archeologist Diana Angelo and Arkansas Archeological Society member Sarah Rosenkrans excavated post stains that formed part of a Caddo building at 3MN298. 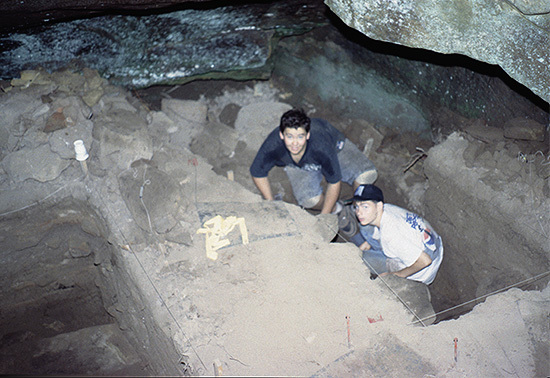 A 1996 cost-share agreement between the Ouachita National Forest and the Arkansas Archeological Survey produced a detailed research design for investigating novaculite quarry sites in the southern Ouachita Mountains, later published in The Arkansas Archeologist. Another cooperative agreement between the U.S. Forest Service, the Arkansas Archeological Survey, and the Arkansas Archeological Society led to archeological excavations at two sites in the Ouachita National Forest. These investigations were part of the Society’s Training Programs near Oden in 2013 and 2014, co-directed by Mary Beth Trubitt and Meeks Etchieson. The sites were chosen because of their potential to answer questions about toolstone choices, plant domestication, social identity, and culture change in the Upper Ouachita River Valley. Fragments of a ceramic jar with incised decoration were found at 3MN298. 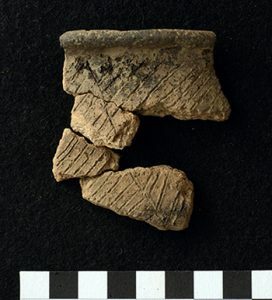 Recovered artifacts show evidence of site use from the Middle Archaic period through the Mississippian or Caddo period (ca. 6000 B.C. to A.D. 1650). At 3MN298, crews uncovered traces of architecture such as fire pits or hearths, stains from wall posts and postholes, and grass-impressed daub. Funding from the U.S. Forest Service and Arkansas Archeological Society has allowed us to analyze 11 radiocarbon dates from the site. Specialists identified a wide variety of animals, fish and shellfish, and wild and domesticated plants that people used for their food. Squash was an early domesticated crop used during the Woodland period in the Ouachita Mountains; a piece of squash from the site has now been dated to A.D. 825. Artifact analysis and interpretations continue at the Survey’s HSU Research Station. Ceramic sherds from 3MN298 are currently undergoing chemical characterization analysis. Results will establish the chemical signatures of local pottery in the Upper Ouachita River Valley, and will be compared with results from sites in the Arkansas River and Middle Ouachita River drainages. As a result of these projects, the Ozark-St. Francis National Forests and Ouachita National Forest have information to manage future use of archeological sites on their lands. The archeological field and laboratory work contributed by Arkansas Archeological Society volunteers provided a tangible cost savings to the Forest Service and the Survey. The research give current residents of Arkansas new understanding of the communities and people who lived here in the past.